Lord, let it be your voice that speaks through my mouth, and let our hearts and minds be open and receptive to hearing the Word & Mission you have for us here, today. Amen. I was mad and hurt. Here I was, one of the only whites that Church, eager to learn and do whatever I could to bridge the gap between whites and blacks, and this young woman rejects me using a shirt with language on it that shouldn’t have been worn in public at all, let alone in a church! Why would she do such a thing? I violated the boundaries; and yet, I did not fear for my life, as she would have in my position. The worst that could happen to me was rejection. This is the whole point of the “Black Lives Matter” movement, to make us aware of a distinction that we have not seen until now, even though it has always been there. We all know the Civil War ended slavery, but slavery was only the most painful symptom of a whole mindset and culture that did not change or disappear so easily; and those who benefitted from Racism soon reclaimed much of the power and control they’d lost through the Jim Crow laws, the tyranny of sharecropping, denial of the vote, and injustices and terrorism of every kind. As a result, millions of Blacks fled the Old South hoping for better lives in the North, the so-called “Great Migration,” which lasted throughout much of the 20th century. They encountered racism here in the North, too – but of a different kind. They were seen as strikebreakers and job stealers. Their skin color was enough to brand them as illiterate thieves and lowlifes who destroyed neighborhoods and property values, bringing only burdens, no benefits, to the cities and towns where they settled. Some of my family members are black, and I see how racism has manifested itself in their lives, even if they themselves often seem blind to it. Schools have low expectations for them, because they are black. Jobs are menial, because they are black. They are expected to be druggies and sluts, because they are black. They are frozen out of respectable neighborhoods, because they are black. They have been infected with a sense that they can’t achieve or do even a fraction of what I’ve achieved, because they are black. There is no place for them, they’ve come to accept the fiction that their lives don’t matter. And, like my friend Shermaine said, they can’t escape, because it is all too easy to see that their skin is black. Black Lives Matter. Louis Mitchell (whom we plan to have as a guest preacher here in March), is a transgender man from the Springfield area. With his permission, I will quote him here: “[what] impacted me so deeply were that even as a butch, black lesbian I was not targeted as a threat by police, but in the first 6 months post transition I was “pulled over” 200% more than in my previous 23 years of driving. I put “pulled over” in quotes because 3 of those times I was sitting in my parked car, engine off, legally parked – once outside my house and once writing a rent check across from my realtor’s office. Also, there is the constant negotiating between my fear and being feared because of my incarnation [as a black male] – a daily balancing act. I am not allowed anger, justified or not, because it plays into the stereotype. I am not allowed sadness, because it may be seen as weakness as a man. There are so many things that my “othering” robs me of – whether in truth or just in my own fears.” — Louis’s testimony exactly reflects what I quoted earlier from Dr. King. Blacks are fed up with the crime of “Driving While Black”. They are fed up with being looked at as criminals by neighbors and law enforcement alike. They are fed up with poor schools, poor jobs and crumbling neighborhoods. They are fed up with justice and economic systems that are heavily slanted in the favor of us who are wealthy or white. They are fed up with always being under suspicion or targeted because of their skin color. And, they have every right to be angry. The problem of Racism in the North is not a “Police Brutality” issue. Most police are sincere, dedicated, determined, well-trained and even compassionate professionals. We cannot allow the few who are brutal or racist or poorly trained to brand the entire profession and the public’s trust in them. We cannot allow those who commit crimes in the performance of their duties, nor their superiors, to escape responsibility for their actions. Besides, targeting a few errant officers displaces the blame. They would never have done what they did if our laws, our system of justice and government, our economic priorities and structure, our education system, and so many other aspects of our society, treated blacks as equals. The discrepancies never bothered those of us who benefit from the imbalances, so we’ve often never even realized they exist. We’ve been blind to them, let alone seen a need to rectify them. These injustices exist because we have allowed it, even if we did so unknowingly. Black Lives Matter. The “Open and Affirming” process, which we are currently going through here at ARK Church, opens us up to not only welcoming into our midst those who are different, no matter what the difference is, but affirming who they are. Affirmation is a positive action, a concrete demonstration of our determination to make room for everyone we meet. We reject racism’s theme of “There is no place for you here.” Instead, we are determined to make room. We are committed to allowing ourselves to be changed by those we welcome into our midst, instead of demanding they change to become just like us. King knew that racism not only afflicts those who are oppressed, it also afflicts those who benefit from the oppression – enveloping all of us in a fog of fear, powerlessness and misunderstanding that isolates us, stunts us, and prevents us from being the people God wants us to be. King said “We are caught in an inescapable network of mutuality, tied in a single garment of destiny. Whatever affects one directly, affects all indirectly.” In other words, we are all hurt and lessened by racism, not just those of us with dark skin. This is why he also said “Let us all hope that the dark clouds of racial prejudice will soon pass away and the deep fog of misunderstanding will be lifted from our fear-drenched communities…” He didn’t specify which community lives in fear, because both live in fear. Because he knew we are deeply connected, King fought to see that deep fog lifted for all, not just blacks. No human being, no matter what the color of their skin, should have to live in fear. We are all children of God, we are all equally valued and loved by our Creator, and we all need to treat each other with the same love and respect and compassion that God affords to us. In closing, let me leave you with a thought: when we walk out of this church, the question of whether we are going to face the issue of racism and race-based injustice is a choice we can make, because we are all white. And, unlike our black brethren, we can choose to forget about it, unlike Louis, and unlike Shermaine. 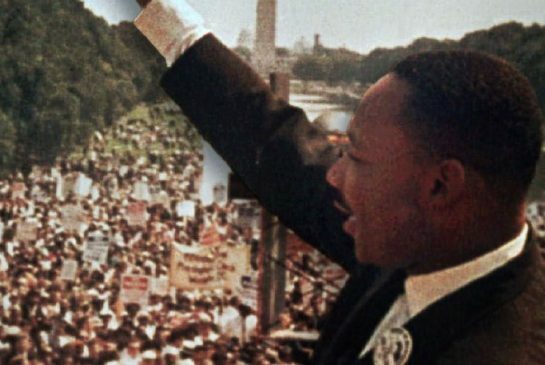 King said “the time is always ripe to do right.” And so I say “yes, the time is always ripe; but are we willing to do right all the time?” It is a difficult and painful challenge to tread that path, but we must never forget that it is the path that our brothers and sisters of color have no choice but to tread every minute of every day. Our choice is whether we shall make room for our brothers and sisters: doing justice, loving kindness, and walking humbly with our God. Delivered at ARK Community Church, Dalton MA, January 18, 2015; (Martin Luther King, Jr. Sunday).